The cyberproceedings for the recent Center for Studies on New Religions (CESNUR) conference in Salt Lake City are now being posted online. My paper can be accessed here. The latest edition of Sacred Tribes Journal is available, Volume 4, Number 1 (Spring 2009). 'Transitions' » Pair extends a bridge to those leaving the faith. Saving Mormon souls from the perceived falsehoods of their faith typically has included dubbing the church a "cult" and providing a point-by-point comparison with traditional Christianity, while caricaturing Latter-day Saint believers and practices. Such tactics may fill the pews and energize the Evangelicals, but to John Morehead and Ken Mulholland, they are not the best tools for ministering to Mormons. "We need to provide something constructive and Christ-centered that takes into account a true understanding of the journey they've have been on," Morehead says. To that end, Morehead and Mulholland have produced a 14-minute trailer for a full-length multimedia effort called "Transitions: The Mormon Migration from Religion to Relationship." It mirrors the personal approach seen in "Mormon Messages," made by The Church of Jesus Christ of Latter-day Saints and circulated on YouTube, featuring individual converts, telling the story of their faith and how they came to join the church. In a similar way, Morehead and Mulholland took to Salt Lake City streets, interviewing people who had left the LDS Church and who stayed, asking each how they viewed those who didn't share their beliefs. "I loved growing up LDS. ... The tipping point for me was desperation," says Shawn, about his reasons for dropping out of Mormonism. "Nothing gave me solace, peace in my heart." After a series of personal crises, Christine Nelson says, she didn't know where to go. "I saw no hope, I didn't know if my life could ever be OK again. Nothing had prepared me for that moment." Emigration is the best metaphor for the experience of leaving Mormonism as thousands do each year, Pastor Ross Anderson says in the trailer. "Because a person is coming out of the homeland, they've made a decision to go somewhere else," he says. "But they bring with them all their stories and heritage and identity. An immigrant settling into new land doesn't have to repudiate all that, but they have to learn to live in this new home. That's the experience of Latter-day Saints coming to live among traditionally believing Christians." The "Transitions" trailer is the first major project of a new think tank, the Western Institute for Intercultural Studies, Mulholland and Morehead created in Utah to "equip individuals, congregations and Christian academics to communicate the Christian faith to adherents of new religious movements with understanding and sensitivity." As America's religious landscape continues to evolve, theirs is an urgent assignment that goes well beyond Mormonism, they believe. While 40 years ago, an interfaith encounter might have involved a Methodist living next door to a Catholic, in the 21st century the situation has changed dramatically: Your neighbor might be a Mormon, a Wiccan, a Pagan, a Muslim, a Hindu or a Buddhist. This exotic mix of religions perplexes most Christians, Morehead says, but it cannot be ignored since family members, loved ones, friends, neighbors and co-workers increasingly are adherents of these movements. How are followers of Jesus Christ going to respond to this changing society? "A lot of people in Protestant churches don't know what these movements are or they have the crudest ideas about them," Mulholland says. "They want to share their faith but they don't want to be jerks. Unfortunately, the only model they've seen is combative." Morehead and Mulholland have been working on providing a model for cordial interactions for more than a decade. Mulholland was founding president of Salt Lake Theology Seminary, which closed its doors earlier this year after 20 years of operation. Morehead taught at the seminary and is co-editor and contributing author for Encountering New Religious Movements: A Holistic Evangelical Approach. He is also the editor of Beyond the Burning Times: A Pagan and Christian in Dialogue and co-founder and co-editor of the "Sacred Tribes" e-journal. In the months before the 2002 Winter Olympics in Salt Lake City, Mulholland and others at the seminary worried that out-of-town Evangelicals would descend on Utah, attacking Mormons in a negative way. So they produced "Bridges: Helping Mormons Discover God's Grace," a video about LDS beliefs that included the perspective of Mormons themselves. It offered a kinder, more respectful approach to sharing Christian teachings with Mormons, drawing on years of living among Latter-day Saint neighbors and friends. "Bridges" included an emphasis on interactions between Evangelicals and Latter-day Saints through the development of "relationships rather than confrontation," Morehead says. Mulholland estimates that more than 25,000 Christians have now used "Bridges" as a way to share their faith with Mormons. Now the Western Institute's "Transitions" adds to that approach. "God has been so gracious in pouring out a new kind of grace into our hearts into really love these people," Mary Golding says in the trailer. "Not just love them so they get converted, but to love them enough to walk with them to get them through the process, to say you are not an accomplishment, a project to us. You are an individual that Jesus loves." Such Christians are saying, "I'll walk with you across the bridge," Golding says, "and in this transition for as long as it takes." For more information about the Western Institute for Intercultural Studies, go to http://www.wiics.org/. Saturday I will attend the Center for Studies on New Religions (CESNUR) international conference in Salt Lake City with the theme "Mainstreaming and Marginalization of Religious Movements." The conference will be held June 11-13 in Salt Lake City's City Hall building. The program can be accessed here. I will be presenting a paper titled "From 'Cults' to Cultures: Bridges as a Case Study in a New Evangelical Paradigm on New Religions." I am looking forward to taking in some lectures, making my presentation, connecting with colleagues, and forging new academic relationships. Fears and scenarios concerning the ultimate End of things are far more broad and diverse in the late modern West than the Left Behind novels of evangelicalism and popular culture. 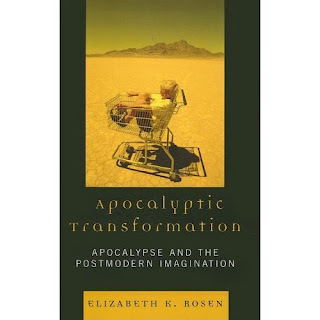 Elizabeth Rosen discusses this topic in Apocalyptic Transformation: Apocalypse and the Postmodern Imagination (Lexington Books, 2008), one of the most enjoyable books I have read in a while. Rosen begins her discussion with an introduction into apocalyptic thinking. She notes that just as human beings need origin stories or myths to explain our beginnings, so we also incorporate stories of the End in order to come to grips with the threats of the end in the face of social chaos and the finality of the human story. She also draws the reader's attention to the fact that stories of the End are sense-making myths that serve as "an organizing principle imposed on an overwhelming, seemingly disordered universe." Used in this fashion, apocalyptic stories function much like conspiracy and chaos stories. In the history of the Western world the Judeo-Christian apocalyptic has been the most influential. In that religio-cultural context one of the key apocalyptic texts has been St. John's Book of Revelation. In that piece of literature the Greek word for apocalypse refers to an "unveiling," literally meaning a revelation provided to the reader as a means of providing a sense of peace and purpose to the seeming chaos and social disruption surrounding them. In contemporary popular usage the term "apocalyptic" has moved beyond this specific meaning to serve as a general phrase referring to the End. Although the Judeo-Christian apocalyptic continues to be popular in various circles, and to exert influence outside of its specific religious context, other visions of apocalypse are found throughout popular culture. Here the context of late modernity or postmodernity puts an interesting twist on apocalyptic myth as it seeks to, as Rosen states, "reject the myth's absolutism or [to] challenge the received systems of morality that underlie it." Having laid her foundation through the Introduction Rosen then explores differing ways in which apocalyptic myths have been explored in popular culture. Given my personal and academic research interests I appreciated the diversity of cultural sources that she drew upon in consideration of apocalypse, including graphic novels, books, and film. Several case studies in Rosen's exploration were of great interest to me. These include a look at Alan Moore's graphic novel Swamp Thing, which Rosen describes as "a veritable collection of apocalyptic stories," a differing apocalyptic twist in Moore's Watchman graphic novel, Terry Gilliam's films Brazil and 12 Monkeys, and the Wachowski Brothers' Matrix trilogy of films. And just as the deities in these postmodern recastings of the apocalyptic myth are sometimes doubting and unsure, Gilliam, too, has identified his films as part of his own search for meaning. If you look at everything I've done ... they're all trying to discover the truth....Perhaps they're really trying to find out what the question is. I used to think I had the questions and it was just the answers I was searching for. But the older I get, the more lost I feel, which stimulates more questioning. As I read through Rosen's book it seemed to me that many evangelicals are likely not even aware of the popularity of apocalypse in the postmodern imagination, and in the variety of ways in which the Judeo-Christian apocalyptic is being deconstructed and reconstructed, and new apocalyptic visions are being created in popular culture. Perhaps rather than merely consuming a fictional form of evangelical Dispensational apocalyptic we might broaden our awareness of other visions for the End (whether conceived in linear or cyclical fashion), in order to consider how differing visions of the New Jerusalem speak to the late modern imagination.